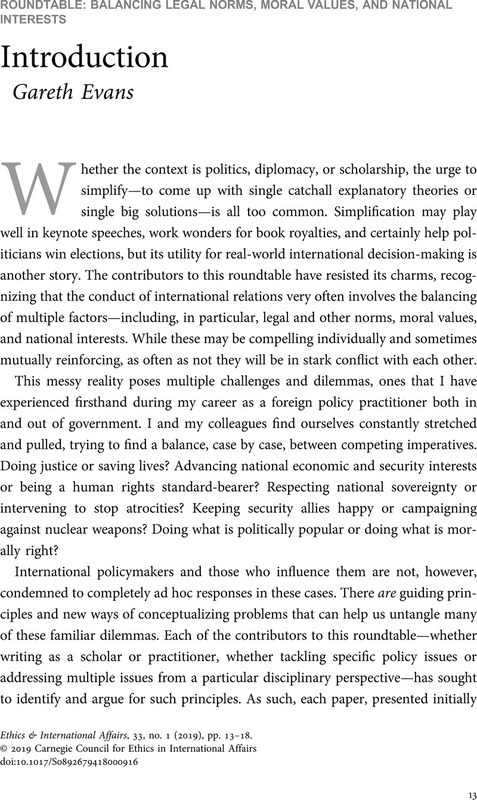 1 See, for example, Wheeler, Nicholas J. and Dunne, Tim, “Good International Citizenship: A Third Way for British Foreign Policy,” International Affairs 74, no. 4 (1998). 2 International Commission on Intervention and State Sovereignty, The Responsibility to Protect (Ottawa: International Development Research Centre, 2001), www.globalr2p.org. See also Evans, Gareth, The Responsibility to Protect: Ending Mass Atrocity Crimes Once and For All (Washington, D.C.: Brookings Institution Press, 2008). 3 See Evans, Gareth, Incorrigible Optimist: A Political Memoir (Melbourne: Melbourne University Press, 2017).